Ready to give up smoking? With the government's 28-day national stop smoking challenge, Stoptober, what could be a better time to find out some new and interesting ways to help us quit the puff! Lets face it going cold turkey and nicotine patches isn't the only way to can the habit. Here are 12 more weird and wonderful ways to help you stop smoking (for good)! New research by Boots has found that over 52,000 people across the UK could enjoy their first smoke free kiss this month! And with Stoptober in full swing, NOW is a great time to quit smoking. Think about it. The benefits of quitting can quite literally change your life. From looking ten years younger to dramatically reducing your risk of heart disease and cancer and feeling well, AMAZING there is no reason you shouldn't give giving up a go. The research also highlighted that 61 percent of smokers say quitting smoking is one of their lifetime ambitions so it's safe to say there's a lot of people that need help coping with cravings this month. With this in mind, we enlisted the help of the UK’s leading e-cigarette brand, Socialites who've come up with some top tips to help you quit smoking. We also teamed up with Boots' UK pharmacist Angela Chalmers who gave us her expert advice on helping you through. Now here's what you need to know. Understanding your problem is the first step to a smoke free life. People turn to cigarettes for so many different reasons, whether it's stress, dieting, social groups or a personal problem there is always a reason. Get behind it. Once you can identify why you smoke you'll be better prepared to avoid them in the first place. Yep, this is a thing. Some people bury their cigarettes in hope that they can quit for good and it seems to be pretty effective for people! Think about it. If you bury your pack outside this will mean you'll have to dig it up later which can be pretty off-putting (especially if it's raining). Sometimes it can be difficult to motivate yourself. So a great way to stick at it is by making a list of reasons about why you want to quit and stick them all around your house. Stick them on your dresser, toilet, front door, kitchen - you name it. This will help keep you determined and mindful to help curb the bad habit all together. It's really important to seek help in order to stay smoke free. But once you've tried all the aids and have even gone as far as eating your cigarettes (hey, some do it and never turn back) it might be a good idea to try something totally different. Perhaps something a little bit out of your comfort zone, like hypnosis. Hypnotherapy helps open your mind to different suggestions. Your therapist will be able to change the way you think so that next time you think about lighting up, you're repelled by the thought of it. Everyone responds differently to different things. Patches, gum, lozenges, sweets - they all serve a purpose so use the things that work best for you. You can also use e-cigarettes such as Socialites which allow you to vape without the 4,000 harmful chemicals or 60 known carcinogens found in traditional cigarettes. They're always better than smoking. 6. Find a Stoptober buddy! Quitting with a friend or family member is an effective way of encouraging and supporting each other. You want someone that will stick by you through the tough times, right? You're in it together! Be vocal about your goals for quitting. The best thing to do is tell all your family and friends and make a bet with them! Maybe they can bribe you with a nice dinner if you quit smoking for three months or even bigger, they can offer you a holiday if you stop for one year! You'll be motivated and most importantly, you won't want to let anyone down. None of this 'I'm just popping out for a cigarette!' talk. Procrastinating is every smokers' enemy. What you need, is something new to occupy yourself! Angela says, "Why not distract yourself by taking up a new hobby such as learning a new language , trying a new recipe or playing a sport? ​Or you could get round to doing something you’ve been meaning to do for a while – clearing out your wardrobe, even cleaning the windows! Creating a list of all the things you want to do and ticking something off that list can give you a great sense of achievement!" Think about it. You'll be getting so many things done you'll realise having a cigarette is just a waste of time. Nail down your smoking triggers! 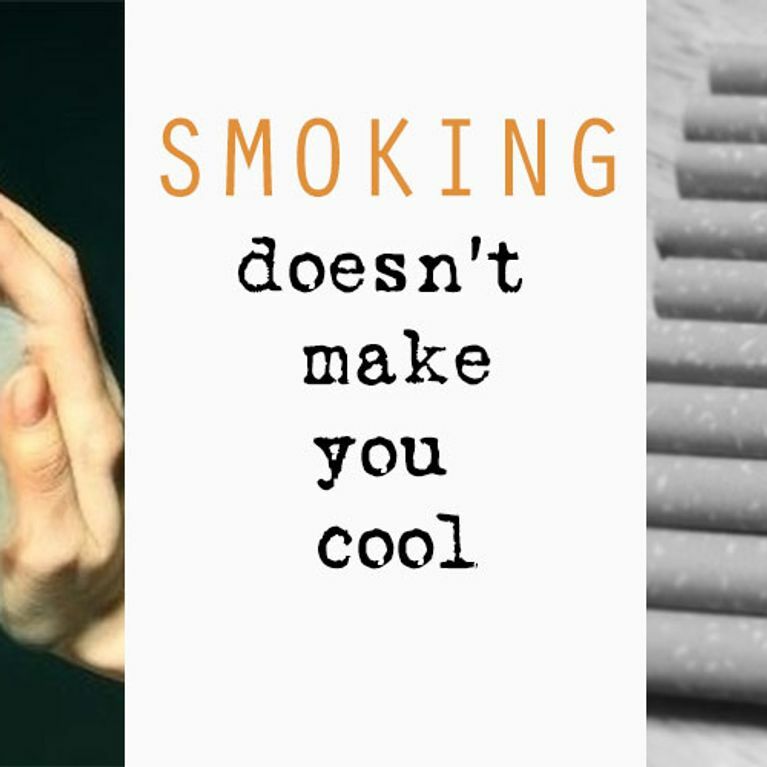 Angela says, "More often than not there are factors that can trigger smoking habits or make you want to smoke. Replacing your triggers with a different healthy habit can help." Drink an extra glass of water after meals to keep you feeling full. Snack on as many fruits and veggies as you want – something crunchy like baby carrots or an apple, can sometimes be very gratifying. Keep your hands busy with something besides food - be productive. Money is a great motivator so if you, for example, normally puff one pack per day put then put that money aside and save it instead. By the end of the month you'll be able to see how much you actually spend on ciggys and hopefully by the end of it, you'll realise how much you're wasting. Only 3-4 percent of people are able to quit with willpower alone so if you can make it a habit, do it. Acupuncture can be especially effective for smokers but more specifically the auricular method! The treatment in general is known for it's detoxification, de-stressing and endorphin boosting benefits which can greatly help curb cravings, keep you calm and make you feel more healthy all round. Ear massages are also really effective at fighting cravings. You don't know until you try, right? Quitting smoking is not easy so give yourself some credit! Angela says, "Remember – one of the best benefits of stopping smoking (aside of course from the health improvements) is all the money you will save! Use this to reward yourself with a treat or something fun." YOU DESERVE IT. Are you up for the challenge? Tweet us @sofeminineUK!